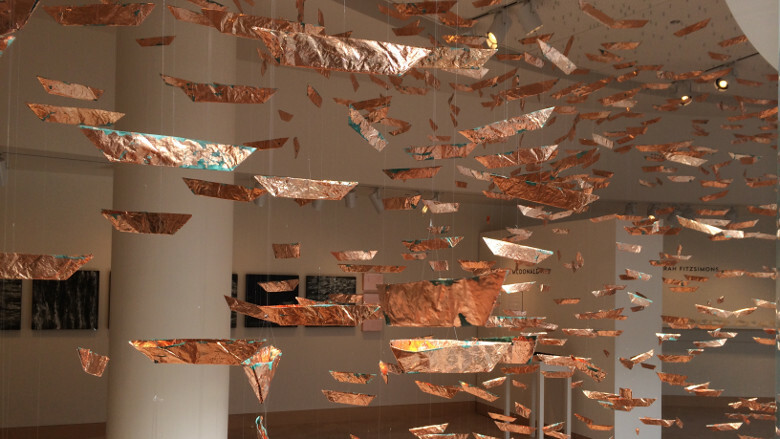 Waterways features three Wisconsin artists--Sarah FitzSimons (Madison), Marsha McDonald (Milwaukee), and John Miller (Madison)--whose work investigates the essential nature of water. Through research and patient observation, each has dedicated themselves to understanding the messages conveyed by waves, ripples, and still waters, the deep edges of rivers and the pull of ocean tides. John Miller, an avid boatsman known for his watery landscapes, is developing a visual lexicon of water’s movements that is both calligraphic and intensely realistic. Marsha McDonald is a painter, photographer, and filmmaker whose oeuvre takes a contemplative approach to the study of water. Sarah FitzSimons makes quilts, drawings, objects, installation art, and short films that investigate how water shapes the land. Sunday, March 15, 1:30-3:00pm, Watrous Gallery: Join us in the gallery for informal talks with John Miller and Marsha McDonald. Sunday, March 22, 1:00-4:00pm, Wisconsin Studio: Waterways coincides with World Water Day and the Academy's ongoing Waters of Wisconsin initiative, an in-depth examination of the challenges facing Wisconsin's groundwater, lakes, rivers, and streams. Our World Water Day celebration, held in Overture’s Wisconsin Studio on Sunday, March 22, 1:00-4:00 pm, will include brief talks by the artists, an overview of the Waters of Wisconsin initiative, and a performance of Handel’s Water Music by members of the Wisconsin Chamber Orchestra. Since seating is limited, we encourage you to register in advance online. Marsha McDonald's 1000 canoes installation. Marsha McDonald, Moon Boxes, detail. Sarah FitzSimons, Sketch for Ocean Blanket. Water Map. Visitors were invited to locate a body of water on a map of Wisconsin, pin it, share the memory on a post-it and stick to the wall in order to build a Body of Water in the James Watrous Gallery. Map courtesy of the Department of Natural Resources. Sarah FitzSimons combines sculpture, photography and video to create pieces that range from temporary interventions to permanently placed work. Her projects often involve oceans, deserts, rivers, or mountain ranges, and explore collisions of the physical and metaphoric. Marsha McDonald was born in Toledo, Ohio. As a child, she attended art classes, first at a convent, then at the Toledo Museum of Art. In high school, she was awarded a National Honorable Mention by the Scholastic Writing Awards, as well as an Ohio Governor’s Art Award. She received her BFA from Minneapolis College of Art and Design. John Miller lives with his wife Faith and their dog Callie a short portage from the water in Madison, Wisconsin. Much of his professional time is spent helping clients to explain ideas with images.